Gov. Mary Fallin enters the House chamber to deliver her "State of the State" address on Feb. 1. Political observers say she will need to work intensely behind the scenes to succeed in pushing through the revenue-raising measures she proposed. Gov. Mary Fallin to Oklahoma lawmakers: We need hundreds of millions of dollars, fast. Here are my ideas. What have you got? That’s not exactly how Fallin put it in her “State of the State” address to the Legislature on Feb. 1. But it’s the essence of what she said, according to several officials and analysts asked to assess the governor’s response to Oklahoma’s fiscal crisis. The state is facing an estimated $900 million budget hole that could soon grow to more than $1 billion. It is also likely that the Office of Management and Enterprise Services could announce another revenue failure in coming days, setting the groundwork to deepen the 3 percent across-the-board cuts ordered in December. 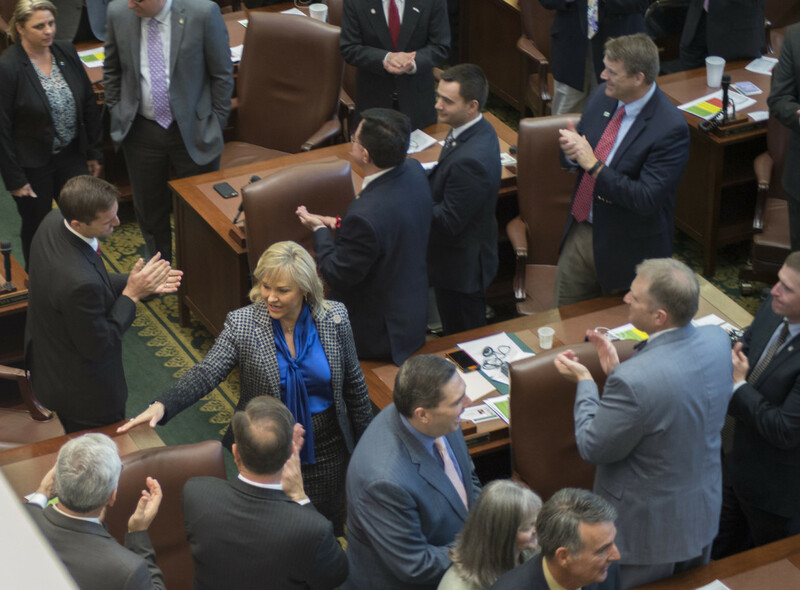 In her “State of the State” address, Fallin told lawmakers it was time to find ways to mitigate budget cuts that would slash into core state services such as education. Fallin’s proposed budget for the 2017 fiscal year contains a half-dozen or so significant revenue-raising proposals, several of which would represent departures from the political status quo of recent years. If no new money is raised, state agency cuts will average 13.5 percent, she said. If all of her proposals were adopted, they would average 6 percent. Select agencies would take a 3-percent cut. Fallin’s revenue-raising plan contains elements that challenge the political orthodoxy of recent years. But it will take more than a State of the State address to push them through a reluctant Legislature, said former State Senate President Pro Tempore Cal Hobson, a Democrat. “Now’s about as deep a crisis as I can remember going back to 1984 and 1985, when oil dropped (below $30 a barrel) and we did raise taxes,” Hobson said. Here are summary descriptions of the entrees on Fallin’s money-raising menu, along with the assessments of their financial impact and political prospects. 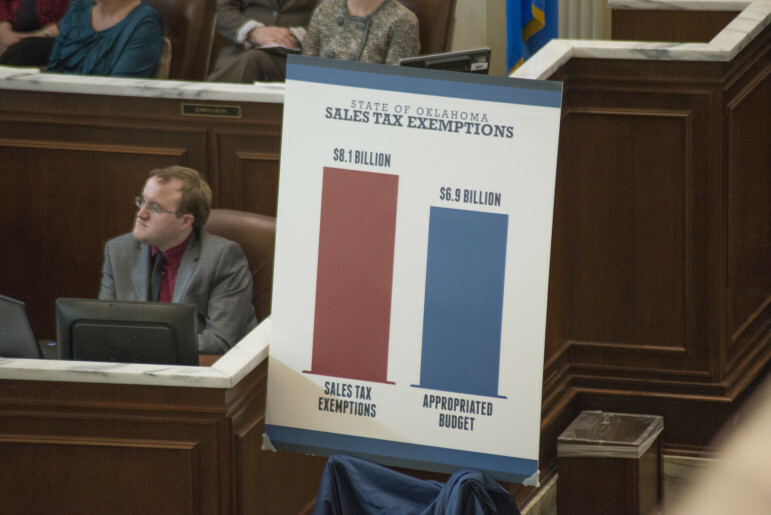 A chart presented by Fallin during her “State of the State” speech compared total sales tax exemptions, which she proposed to reduce, to the appropriated budget. The biggest single money-raiser on Fallin’s menu would “modernize” Oklahoma sales and use taxes by eliminating some unspecified exemptions, extending the twin taxes to more services and attempting to capture more tax collections on Internet purchases. It also could be the most contentious. Every sales or use tax exclusion has a built-in constituency that will protest vehemently against losing its protected status. In addition, applying the state’s 4.5-cent levy to new categories of sales will be characterized in general terms as a tax increase, something most Republicans and many Democrats have been unwilling to consider for some time. “For her to come out and say we ought to look at taxing services or doing more with the Internet, that’s certainly a bold proposal given where a lot of her political backing comes from,” said former state Finance Secretary Tom Daxon, a Republican. “It’s going to take some real leadership up front to tell all the business leaders to ‘call off your lobbyists, call off your dogs,’” said Daxon. Daxon and Keating said it made sense to consider taxing more services and collecting more taxes on Internet commerce. That’s where much of Oklahoma’s future economic growth will occur, but the state has not revised its tax code sufficiently to reflect that. Examples of services that currently go untaxed in Oklahoma are residential utility bills, cable TV, barbers and beauty salons, car repairs, landscaping, health clubs and dry cleaning. Those and other services are taxed in some states. Collecting more use taxes on Internet purchases from out-of-state vendors shouldn’t even be considered a tax increase, Daxon said. The use tax is already on the books. The state simply lacks an effective means to enforce it. Even so, any attempt to expand the sales tax base is likely to encounter immediate opposition from die-hard tax opponents. Daxon said he thought Fallin would fare better if she accompanied her money-raising plans with the proposed elimination of some state programs or policy reforms that tax opponents would consider meaningful. Fallin billed her proposed cigarette tax increase as a public health measure that also doubles as a new revenue source. Her proposal would increase the per-pack tax from $1.03 to $2.53. Democrats pounced on the proposal as a sign that Republican-led income tax cuts are siphoning too much money from the state’s general revenue fund. Rep. Scott Inman, the Democratic minority leader, said his caucus won’t support the proposal. Part of the decrease in cigarette tax revenue is due to fewer Oklahomans smoking, a trend the governor wants to keep pushing. The state put $36.7 million in cigarette taxes into the general revenue fund in fiscal year 2013, according to the Office of Management and Enterprise Services. The state is projected to bring in $33 million this fiscal year and $32.7 million in fiscal year 2017 based on the current per-pack tax. Not all cigarette tax revenue goes into the general fund, with some of the money earmarked elsewhere. Fallin’s proposal would send all new revenue to the general fund. The tax may also be a tough sell among Republicans. Senate President Pro Tempore Brian Bingman, R-Sapulpa, said it’s unlikely any tax increases will get through the Legislature since they require approval from 75 percent the House and Senate. Part of the challenge is getting tax increases through the Legislature in the pending election cycle. Republicans up for re-election may be reluctant to support any tax increases this early in the session out of fear they may draw a primary opponent. Those Republicans may be more receptive to Fallin’s proposals once the deadline to file for a race passes. That deadline for state offices is April 15. Raising the cigarette tax may be the least politically risky way to raise new revenue, Gaddie said. During her Feb. 1 speech, Gov. 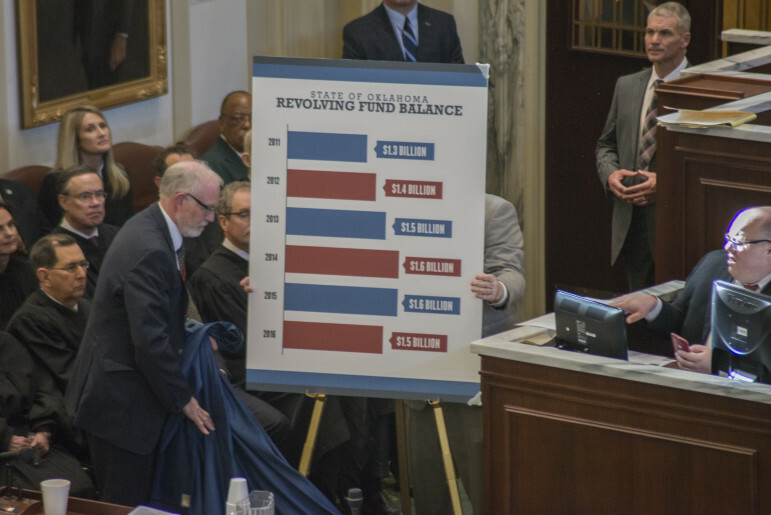 Mary Fallin proposed tapping revolving funds to help ease the budget crisis. Fallin would like to see the state tap into fees, fines and other revenue sources generated by agencies and departments. Those funds replenish annually, and could serve as a recurring source of revenue, Fallin said during her address. Sen. Clark Jolley, R-Edmond, chairman of the appropriations committee, said there might be enough support to push the proposal through, but it will be a tough sell. The threat of an across-the-board 13 percent cut if the Legislature does nothing may provide an incentive to adopt the proposal. The concern is that revolving funds are collected by agencies to conduct their day-to-day duties. Gaddie and some lawmakers said this proposal does not generate new revenue. This proposal would require all agencies not receiving appropriated funds from the state budget to share a portion of their revenue. Only 30 agencies not receiving state appropriations share a portion of their revenue with the state. That money is often used to offset costs of using other state resources or programs. The agencies include the State Board of Pharmacy, the Securities Commission and the Motor Vehicle Commission. Another 27 agencies don’t share their revenue. Those include the Turnpike Authority, the Grand River Dam Authority and the Lottery Commission. Gaddie said the complexity of this proposal could work in lawmakers’ favor when it comes to appeasing constituents. Consolidation of school administration will be a tough sell in the Legislature this year, especially because the conversation will spill over into a fear of closing rural schools. Fallin’s proposal would consolidate administration of dependent preK-8 schools with neighboring preK-12 districts. Oklahoma has 516 school districts, 97 of which are dependent districts. Jolley called fears of school closures unfounded. He added the state can’t keep the number of districts and superintendents it currently has. Proposed legislation would consolidate districts based on their size. Many lawmakers and political experts believe that if consolidation doesn’t happen this year, it’s unlikely to occur in the near future. Gaddie said the governor’s push may be a big step toward making consolidation happen. This proposal would give school districts more flexibility on how they use local property tax revenue earmarked for school buildings. The money is supposed to be used for building repairs and maintenance, utilities and salaries for janitorial and maintenance staff. Fallin would like to give districts the flexibility to use this money to hire more teachers and increase teacher pay. Sen. John Sparks, D-Norman, said he believes the proposal creates an incentive for school districts to increase their property tax rates to make up for the state’s failure to properly fund education. Supporters said they believe the plan would give districts more flexibility on how to use excess funds and does not call for a local property tax increase. Hobson, the former Senate president, said Fallin has her work cut out for her if she hopes to win approval of her money-raising measures. But she can’t do all of the heavy lifting by herself, he said. It will require an equal amount of political muscle from Senate President Pro Tem Brian Bingman, R-Sapulpa, and House Speaker Jeff Hickman, R-Fairview. “What the governor and the pro tem and the speaker are going to have to do is be like lobbyists, go up and down those halls, one on one, until they have the votes,” Hobson said.